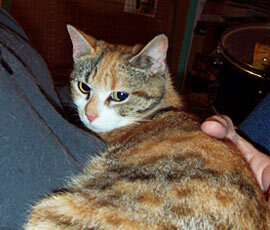 Sharka is a richly-colored calico from Annandale but she's only a half-member of the Love Tribe*. She's shy around people but great with the cat gang. Sharka is named after an other calico from my childhood. She's not shark-like in any way, she's very mellow. And she's coming out of her shell, little by little. Sharka has a crush on Niko & it's so cute to see her react when he walks in. She rushes over to him & greets him with an affectionate arch-backed kitty rub. She follows him around continuing the cuddling. If Niko's snoozing on the cat cot, she snuggles next to him, rolls around & gently paws him. 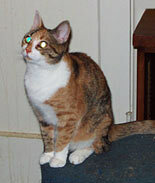 Sharka would love to move in with someone who has time to spend with her & also has other cats. *"The Annandale Love Tribe" refers to some of the cats from the Annandale colony who came to CR!FR already friendly, even though they were born feral.